A couple of friends @el_PatrickL, @tccolby and myself worked on an entry for the candy jam. You play as a candy cop whose task it is to beat all the candy people in the candy kingdom to death. Had I more time I would have added something more sophisticated but ended up working right up until the deadline. This is the first time I have really worked with rigged models and getting them to rag doll given their exotic candy bone structures was interesting. I built the game in unity and despite it saving me tons of time I ran into a lot of strange issues with the collision and physics systems. I will post about in greater detail since the work arounds can be a bit bizarre and most of what is on unity answers is not in an easy to use format. 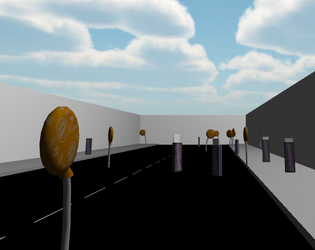 If I had more time it would have been good to add more candy types and add store fronts instead of drab grey walls. I also wanted to add more behaviors for the candies. Right now they get "razzled" when you yell at them with alt but don't really have any fleeing behavior or anything interesting beyond that. I also purposely kept the area of play a rectangular space so I would not have to worry about path finding. If I did have path finding I could have made a more interesting city to explore. Given this is the first game jam I have ever done I thought it went pretty well. They seem pretty fun so hopefully I can convince some people to enter into one again (otherwise people will be stuck with my gross programmer art). You can try the game here on itch.io.